For those born February 9, 1940. 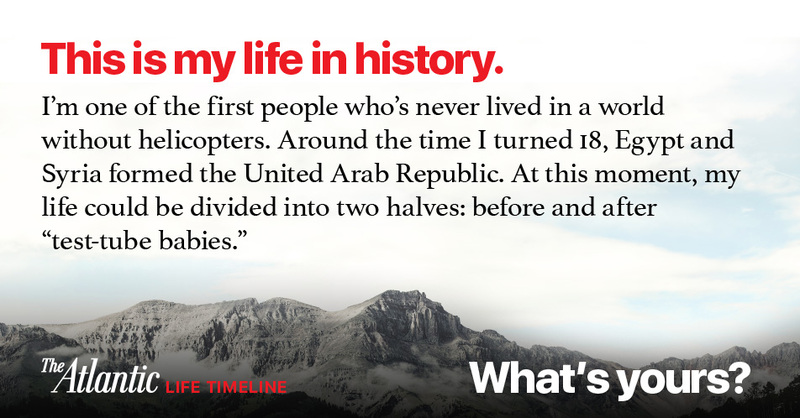 You're one of the first people who's never lived in a world without helicopters. In June 2012, Brian Resnick wrote about University of Maryland's Colin Gore and the test flight of his human-powered helicopter. Around the time you were born, the Walt Disney animated movie Pinocchio premiered in New York City. In December 2006, Benjamin Schwarz wrote a robust review of Walt Disney's impact. You were born in February of 1940. This year, The Atlantic celebrates its 160th birthday, making it 2 times as old as you. The year you were born, Arnold Whitridge wrote about the college undergraduates that petitioned the President not to intervene in Europe during World War II. Around your 18th birthday, Egypt and Syria formed the United Arab Republic. In March 2012, Massoud Hayoun wrote about the modern challenges to pan-Arabism. At 29 years old, you were alive to behold people walking on the moon. Your life can be divided into two halves: before and after "test-tube babies." In October 2010, Cristine Russell wrote about the practice of in vitro fertilization (IVF) becoming more common. In 2007, Nancy Pelosi, who was born the same year as you, became the first woman in American history to serve as the Speaker of the House of Representatives. In September 2015, Andy Kroll wrote about Pelosi's unflagging enthusiasm for political work, and the consequences of her stamina—for her, and for the Democratic Party. When you turned 67, you watched humankind reach the outer solar system.